Apple Store Down - Macbook Pro Coming? 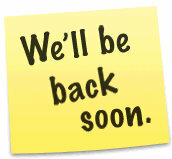 Apple Store Down – Macbook Pro Coming? This leads one to believe that we have a new product launch about to hit The Apple Store. There are rumors spreading like wildfire on the web about a new line of MacBook Pros that could be coming. What is the date that the rumors are hinting at a possible release of MacBook Pros? How about April 13th – which is today! So for now, you can dig around the web and try to find out what Apple is up to. If you find anything interesting about what might be coming to the Apple Store, please let us know in the comments. People have been anxiously awaiting the iPhone 4G to be announced from Apple. Along with the iPhone 4G announcement, people have been wondering if / when we’ll see the iPhone sold at Verizon. So those are 2 main “points of interest” currently buzzing around Apple. And now, of course, we are waiting to see what will be featured at The Apple Store.